Starring Marion Davies, William Haines, Dell Henderson, Paul Ralli, Tenen Holtz, Harry Gribbon, Sidney Bracey, Polly Moran, Renée Adorée, Eleanor Boardman, Charles Chaplin, Lew Cody, Douglas Fairbanks, John Gilbert, Elinor Glyn, William S. Hart, Leatrice Joy, Rod La Rocque, Mae Murray, Louella Parsons, Dorothy Sebastian, C. Aubrey Smith, Norma Talmadge, King Vidor, Coy Watson, Claire Windsor. In reviewing Singin' in the Rain a couple of weeks ago I was again reminded how accurate the musical movie treated its details about the transition to talkies in Hollywood. A great many "movies about making movies" have been made, but few capture the feeling of what the silent era might have been like. Show People is an exaggerated comedy yet has the same satirical bent as the Gene Kelly musical. It also makes fun of the film colony, with the happy cooperation of privileged insiders. They must have considered their cameo appearances as just another party opportunity. The legendary director King Vidor took time out from art efforts like The Crowd for this lively co-production with actress Marion Davies, the delightful comedienne best known for her relationship with William Randolph Hearst. When silent films disappeared in the 1930s her acting accomplishments were overshadowed by the Hearst connection, especially after the movie Citizen Kane characterized her (or her equivalent character) as an untalented loser. Nothing could be further from the truth. Show Peopleis a late-era silent movie. 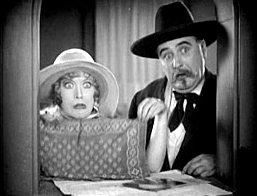 The daffy Colonel Pepper (Dell Henderson) brings young Peggy Pepper (Marion Davies) to Hollywood; she's come to offer her services as a leading lady in serious dramas. After a fruitless stop at the casting offices Peggy meets Billy Boone (William Haines), a comic working away in the trenches of lowbrow slapstick comedies. He secures Peggy a chance to perform assuming that she knows what will happen. She cries buckets of tears when the comics drench her gown in water, and must be given a pep talk to continue. A preview of her movie is a smash, and Peggy is soon wooed away by "High Art Studios", a snooty outfit where everybody affects a superior attitude. Her new co-star Andre (Paul Ralli) advises Peggy to forget all the people she once knew in favor of new and more appropriate friends. Changing her last name to Pepoire, Peggy's manner changes overnight. Her stiff acting in the high-toned dramas does no favors for her popularity. Can Billy rescue Peggy? Can he even get her attention, now that she's decided he's just a vulgar clown? The big discovery for newbies to Show People will be Marion Davies herself, who for years had been seen only in newsreels about fancy parties at San Simeon. It is said that Hearst did indeed promote Ms. Davies' career and that he liked to see her in ornate costume pictures, as a distant beauty. Famous for being a grand hostess and the life of the party, Hearst's paramour was much happier doing exactly the kind of clowning we see in this picture. As a Hollywood fable, Show People is a winner. The silly Peggy Pepper thinks her stage work in South Carolina is going to get her leading roles; when a casting clerk asks her for a photo, she produces baby pictures. In a clip frequently used in montages, Peggy demonstrates her acting range by making outrageously exaggerated faces behind a handkerchief. That moment is so funny that Ms. Davies has us wrapped around her finger from that point forward. Much of the early comedy comes from Peggy's inexperience. Her slapstick director says (in an inter-title): "I didn't know that they made them that green." Peggy steps into the set not realizing that she'll be assaulted with pies and seltzer water, and her shock is genuine. She's mortified to see herself made the fool on screen, until Billy persuades her that the audience loves it, and her too. We can't help but feel that Ms. Davies' personal disdain for dry costume roles is being expressed in the later "dignified" roles. Her function in limp swashbucklers with the pompous Andre (later revealed as a former waiter in an Italian restaurant) is to stand around in fancy gowns. She's pretty enough, but no more dramatic than a cut out fashion doll. "Peggy Pepoire" affects a grotesque toothy non-smile that makes her look like an aristocratic gopher. As Show People sees it, when Peggy's self-importance goes to her head, her appeal vanishes. Nobody and nothing is good enough for her. She even gives The High Art Studio head the cold shoulder when he tries to say that her popularity is slipping. When Billy's comic troupe bumps into the High Art crew filming on location, it's like the circus meeting high opera. Peggy is humiliated just to be seen with Billy. Show People isn't a movie made by outsiders. 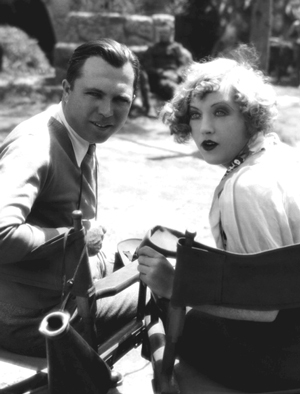 Between the two of them King Vidor and Marion Davies were the best-connected producing partnership in town. The list of celebrities making cameo appearances makes the show a veritable menagerie of Hollywood wildlife. After shows like this tourists to Los Angeles no doubt expected to see movie stars on every sidewalk as they tootled through town in their Model A taxis. Charles Chaplin has a great bit as himself, asking for Peggy's autograph outside the theater where her first film is previewed. And Douglas Fairbanks entertains her in the old MGM commissary (author's unnecessary remark: I've eaten there! I've eaten there!). King Vidor appears in person in a later scene, playing himself. I've read the book about Vidor's investigation of the William Desmond Taylor murder mystery and seen many pictures of Vidor as an older man. In Show People he looks like the friendliest, most natural young fellow imaginable. What a great talent! William Haines is a great Hollywood talent now unknown, a big star in 1930 who reportedly lost his career when he wouldn't take L.B. Mayer's advice on how to run his personal life. Haines segued neatly into interior design and continued to run his lifestyle the way he chose. He can be seen in many MGM silent pictures, especially co-starred with the young Joan Crawford. Short, sweet and funny, Show People is entirely accessible to today's audience, who should be primed to accept it if they still remember if they enjoyed last year's Oscar winner The Artist. 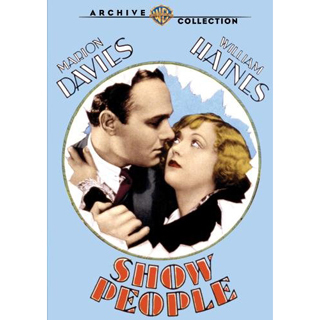 The Warner Archive Collection DVD-R of Show People is a good encoding of a silent movie that has survived in fairly good shape. It may have lost some footage (original timings are couple of minutes longer) but no filmic continuity is disturbed. One scene is marred by a second or two of image deterioration, perhaps mold damage. Although the title could use a major digital restoration (what silent movie couldn't?) the WAC's disc looks quite good and plays beautifully. I believe that the audio track on the picture is an original, as by 1928 films were just about to convert to part-talkies. I understand that it is not the Carl Davis score composed and synchronized at a later date, and listed in the IMDB. 1. Which in a way also seems unfair, as there are plenty of silent pictures that do quite well stressing fancy costumes, elegant surroundings and fussy sentiments.